For this 6th 6 weeks instead of doing the regular skateboard projects everybody else is doing we decided to keep working on our playhouse. Progress with our playhouse has gone really well, in good ways and bad ways but as of now I can say that our playhouse is pretty much done and all we have to do is paint, sand down some pieces of wood that have been left sticking out and we’re done! It has not been easy trying to build and finish this house on time many things happened to us throughout the course of trying to build the house. For example, while cutting out walls and making windows in the walls we would have our measurements be a little bit off and cover the windows more than they are supposed to on the outside or it being too short on the inside or/and the wall wouldn’t fit in. This happened about two times in a row and the way to fix it is we would use the jigsaw to trim off the extra piece of wood covering the window or cut off a bit of the wall and move the wall to the side a bit to where the window and wall fit nicely inside. That was not the only thing that went wrong, at times some of our materials would go missing, cause you know it’s a public place people tend to mistake their materials for ours it’s all good but this was a bit annoying at times when we did need to use the materials and had to miss a day of building because of it. Also the weather, there was a week where nothing but rain was pouring out of the sky and our house would get wet and we could not go outside and build just because it was raining and it would mess up how much time we had to build by a lot. Last but certainly not least, procrastination. At times we would start goofing off and start talking about random things that had nothing to do with the playhouse but fortunately we usually would catch ourselves doing this and one of our team members would remind us and we would quickly stop and get back to work. This is one of the things I liked about being in this group. Having this group as team members was a really good experience for me because I feel like we know how to find the good in bad situations and not take things too seriously but serious enough to get things done and have fun while doing them. Also we know how to split up and concur. This was one of our key methods to finishing our playhouse. We would split up into two groups, each one does a different thing and we get things done faster. In Conclusion, I am so proud of how our play house turned out. 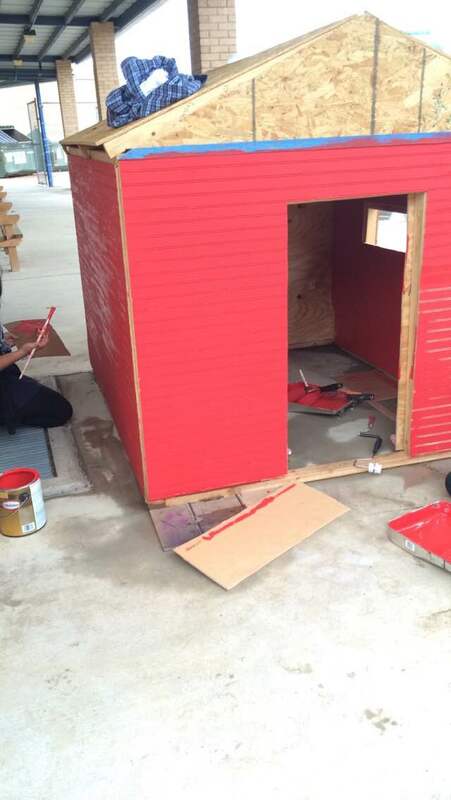 I will add pictures down below of the process of building this playhouse so you can see how it was made. I’d like to thank every one of my team members for coming up with this idea and letting me in on it at the last minute I loved working with them and hope someday I’ll have the opportunity to do something like this again. Coming to Ann Richards was a hard transition because in elementary school everything was planned for us and we just have to follow that plan and do it perfectly. 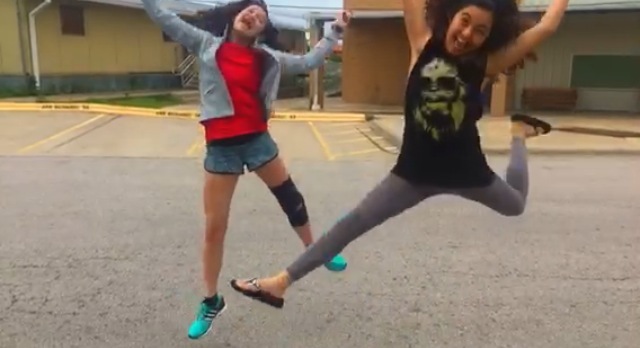 At Ann Richards, there was more thinking for ourselves and solving problems that we didn’t think we would bump into. Most of the failures were in this class, PLTW. There was a time in PLTW where I convinced myself that I should give up. This was during when the Maker Faire was getting closer and the materials just came into the mail. Our project involved computer programming and sewing. So we had to learn about what programs we had to use and how to use them in a matter of days. We had so much to do, our group was debating on whether to come to school on a Saturday. Me, thinking about dropping the project and doing something easier disagreed with this idea. Then I thought about the reason I made this project, to support the LGBTQ community. I thought about how great people form intel found our idea and how they gave us encouragement and advice. I bragged about how great this project was going to be, and then there I was wanting to give up. After a class period of planning on how are project was going to, we found ways to get things done and maybe if we worked hard enough we could finish this project. Turns out our materials were there the whole time, but a teacher took them on accident. This gave me a better idea of where our project was going considering we only had materials. In the end, the shirt was a fail, but for some reason I felt proud because I didn’t give up. When I look at that shirt I see my persistence and determination through the poorly sewn lilypads and LED lights. Salutations! Sadly, this is my last blog post. It’s crazy how fast this year went by. As the year is wrapping up, I’ve taken the time to reflect on all the projects I’ve done this year in PLTW beginning of this year. You’re human, you’re going to fail. It doesn’t matter when or what you did, you’re going to fail. Throughout the first semester, I did a lot of difficult modules not knowing what I was doing half of the time. For the other half of that time, I was obsessed with the idea of perfecting every little thing I did for the assignment. Most of the grades I got for the challenges could’ve been better, mostly because my end products were not the best and completely failed to work. I had the mentality that my first design is the best and won’t fail, which is wrong. Perfecting your project won’t save you from failing. When you do fail, get back up and keep trying. 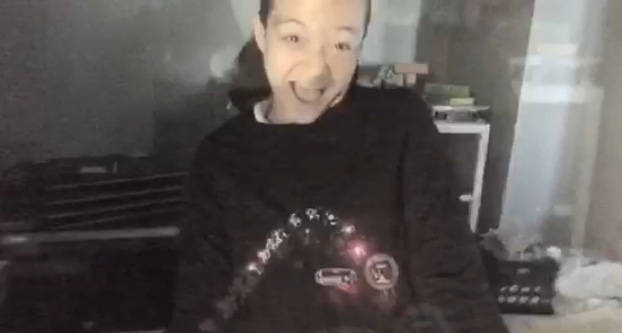 In the 2nd semester, Georgia, Maite, Claudia, Alyssa and I did our maker project on LED light up shirts. We went through so many struggles such as not knowing how to program to the lights to change colors, not having any idea how to sew at all and at some points we had no idea what was going on. Sometimes we regretted choosing our project, but we didn’t give up entirely. Yeah, we got frustrated and gave up on certain tasks, but when we did, we would take a break and start all over on the task and keep trying. Lastly, I want to leave you with how great the idea of failure and resiliency is. Not only was it applicable in real life but also in this class with all the projects. Failure is great and a key necessity to life. Without failure, you can’t succeed. Hey y’all I’m Prisila. I’m a current 8th grader at the Ann Richards School For Young Women Leaders. I take a class called PLTW or Project Lead The Way. 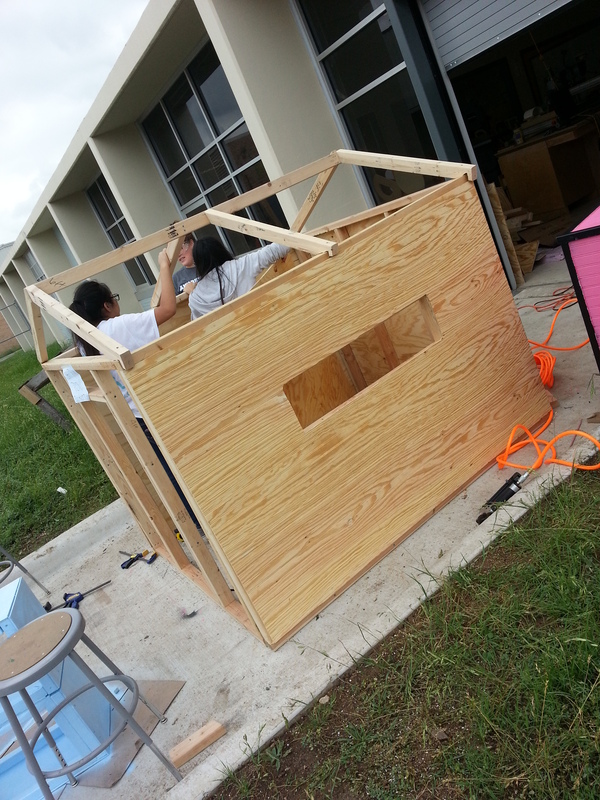 For the class, we had to do a project called “the maker project.” For this project, my group and I decided to build a playhouse. We had measurements, an online model, and a prototype. We then started building our house. During the process of building our house, we went through a lot of failure. Sometimes our measurements were off, or we didn’t have enough material. When we had to build the roof, we had no idea how to do it. We got an idea and tried to do it but it was too hard. When we found an alternative, it didn’t quite work out. We had to make weird cuts that were hard to make on the wood to make it work, but we finally did it. Another time, we had to cut out a wall, but something went wrong. The saw decided to take it’s own turn and we made a wrong cut. We thought that we had lost the wood and wouldn’t have enough to finish the house. We started freaking out, but then we realized it was still useful for a smaller wall. Failure was a big part of our project. I always got really frustrated when things didn’t work out. This project made me really stressed when we encountered failure because i thought we didn’t have time to fix our mistakes. I always thought that we only had a little bit of time, so it always stressed me out. Although I was stressed and frustrated, we managed to fix our mistakes and finish our house.I was really proud of all the work that we got done. Failure doesn’t define anyone or anything. We all make mistakes and we can all go back and fix them. Failure is a part of life and we all have to live with it. I know this sounds cheesy, but you are only a failure if you give up. No, seriously. Otherwise, all of us would be failures. Sometimes, you have a brilliant idea, but it just doesn’t work out, so you need to try another strategy. Sometimes, that still doesn’t work, so you have to try a gazillion different things, and it still epically fails. That is okay though, because if it is impossible, it is not possible, and you may not be the right person to make your idea a reality. Sometimes, you just have to accept the fact that you cannot do everything and that you have limits, so sometimes you have to give up. This year, in PLTW, I was working on making a movie. I made the script for the movie, I got the costumes designed, I got actors for all of the parts, and I knew where we would be filming. Everything for the movie was amazing. I tried finding a time when the actors could come over to our set and film. For weeks, I searched for a time, but there was just no time when we could film. The due date was drawing near, so I had to cancel the movie and come up with a completely different idea for my project. I quickly wrote up the script, and my partner and I filmed the entire video during school hours. The video actually worked out in the end and it will soon be posted on either Youtube, or our blog, so be looking out for Words of Wisdom. In Words of Wisdom, there are a few lessons which Aleeya L. and I think are very important for anybody, not just kids, and not just adults. The lessons are meant to help people become aware of communication issues that people often have. By creating our video, we hope to resolve many of the communication issues. My point in this blog is that whenever you mess up, don’t give up, because until you give up you haven’t failed, but when you give up, that is when you truly fail. Today, I would like you to find something that you gave up on, and try to find a way to finish it and make it better. My goal is that by doing this, you will see that you can usually find a way to make your ideas come true, but only if you put your mind to it. Maybe you’ll have to change something from your original design, but that’s okay. Eighth grade has been a long year, and it’s hard for me to believe it’s coming to an end. There have been times I have failed on a project I was working on, and wanted to give up. But I made it to the end somehow, and I think I have done pretty good. I remember making a video about the mission statement this year, and it stressed me out a lot. I remember so many things going wrong, and at one point we had to refilm clips. That week I had to stay after school almost every day to finish the video, and I remember I just wanted to say, forget it. But I didn’t, and I’m proud of myself. After watching the final video, I was proud knowing I created that and put so much effort in. This was a time that really stuck out to me about how I persevered until the end. Another time, has been in this last project. and think it’s a cool sport or hobby. And even if you’re not the best at skateboarding, you can still have lots of fun, as I’ve learned. Now I want you to think of a famous female skateboarder, or perhaps a famous female engineer/builder. When I asked myself this, I struggled to come up with answers. I wish there were more women associated in things like skateboarding. When I think of skateboarding I think of skater dudes, like Tony Hawk. Women and skateboarding are not common things that go hand in hand. It’s one of those things that is thought of as more of a manly thing. Why can’t there be more women connected to skateboarding? 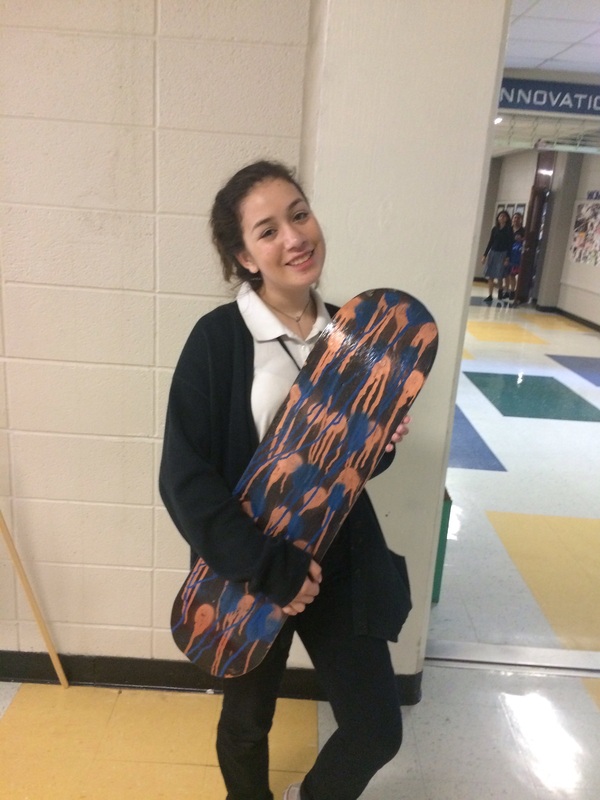 I feel that as the 8th grade class of Ann Richards, building these skateboards is adding to the image that skateboarding can be connected to women. Its also adding to the image that women can do the same things that men can do. 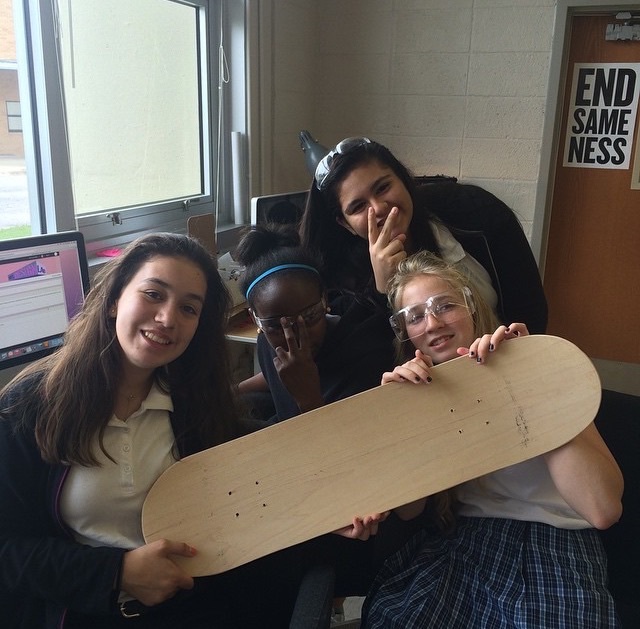 Even though we are not becoming professional skaters, we are still building and constructing them. What we have been doing in class shows that women can do things that may be considered, “manly.” As I came to this realization in the building process, it made me want to keep working and not give up when problems arose. 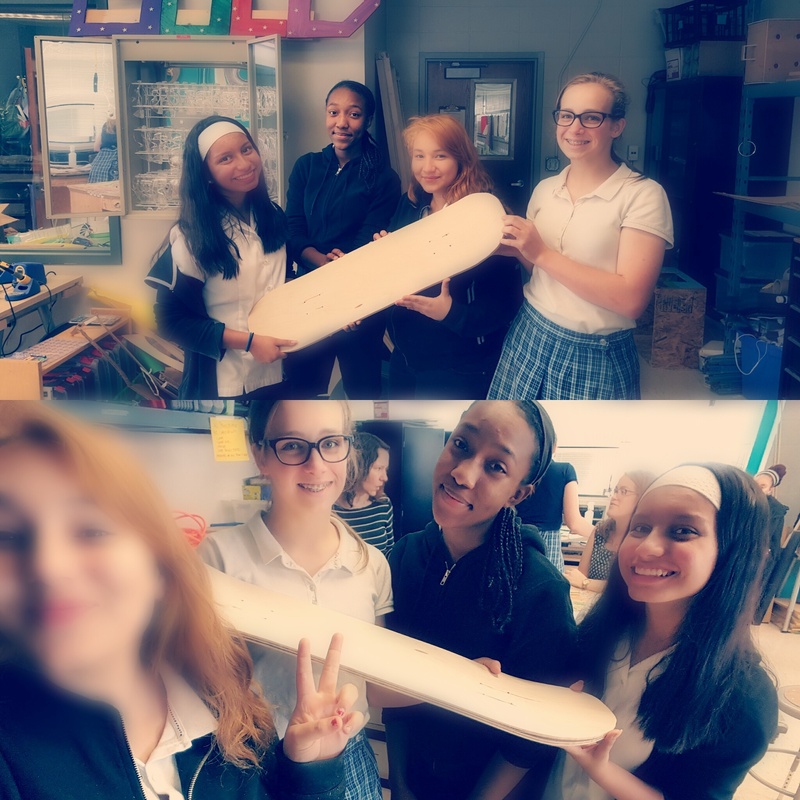 Our 2nd skateboard after we learned from our mistakes. built our skateboard the correct way. Now I would like to quote a senior speech from the other day. She said it was okay to make mistakes, because we learn from our mistakes and they help us grow. I would like to say that this is 100% true. It’s good to make mistakes, and as humans we make them often. This project has taught me mainly two things. The first being that as a woman we are capable of the same things as men. 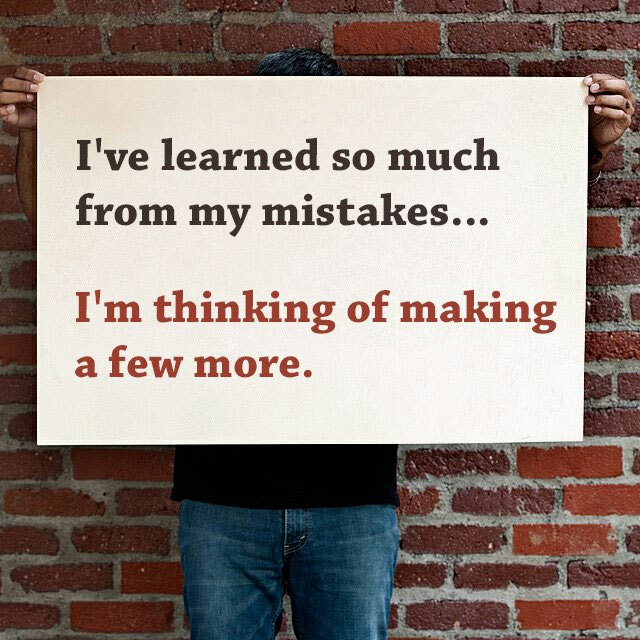 And lastly; to make mistakes, learn from them, and continue on. Just because you have failed once, doesn’t mean you should give up.